The Smithsonian invites the public to celebrate Hispanic Heritage Month (Sept. 15 to Oct. 15) through a series of vibrant performances, lectures, family activities and exhibitions at various museums around the Institution. All programs are free unless otherwise indicated. A full calendar of events and information about tickets is available here. 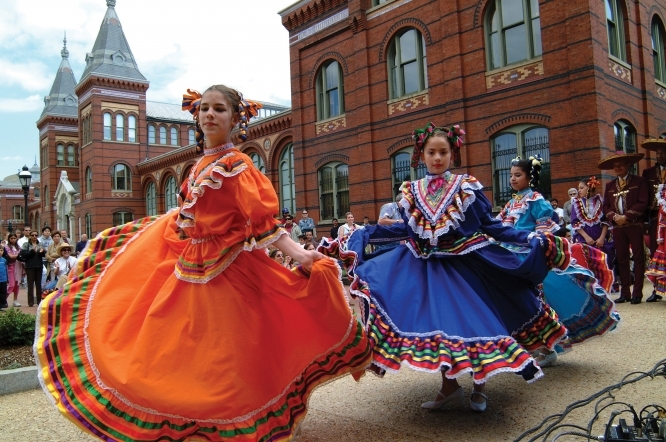 The Smithsonian’s kickoff celebration of Hispanic Heritage Month will be a Family Day hosted by the National Portrait Gallery and the Smithsonian American Art Museum Saturday, Sept. 13, from 11:30 a.m. to 4 p.m. The family day, held in conjunction with the exhibition “Portraiture Now: Staging the Self” at the National Portrait Gallery, will include musical performances, interactive demonstrations, bilingual arts activities, storytelling and gallery tours. Also in conjunction with the exhibition “Portraiture Now: Staging the Self,” the National Portrait Gallery will host two “Meet the Artist” gallery talks: Michael Vasquez will discuss the “code” of a neighborhood street gang found in his paintings and collages (Saturday, Sept. 13; 2 p.m.), and María Martínez-Cañas will discuss the relationship between perceived and physical worlds (Saturday, Oct. 18; 2 p.m.). In partnership with the Woodrow Wilson International Center for Scholars, the Anacostia Community Museum will host “Revisiting Our Black Mosaic,” a full day of discussions on issues of race, immigration, gentrification, education, museums and community in the Washington, D.C., metro area, Friday, Sept. 19, from 9 a.m. to 5 p.m. The 1994 exhibition “Black Mosaic” presented the stories of African-descendants from Central America, South America and the Caribbean, who immigrated to Washington, D.C. Information and registration is available by calling (202) 633-4871. The Anacostia Community Museum in collaboration with WPFW FM 89.3 and Howard University presents “Metro Mambo: Time Machine,” a discussion with Joe Conzo as he shares his archive of rare recordings by Tito Puente and other mambo greats. Dancing and a performance by Orquesta La Leyenda will follow. Saturday, Sept. 20, from 12:30 p.m. to 3:30 p.m. Information and reservations are available by calling (202) 633-4844. The National Museum of the American Indian will host author and artist Sandra Cisneros, Saturday, Nov. 1, at 2 p.m. as she discusses “A Room of Her Own,” a Day of the Dead inspired installation opening at the National Museum of American History Oct. 31. The dynamic Brooklyn band Jarana Beat will perform a new interpretation of Mexican music, accompanied by dancers in Native regalia, at the National Museum of the American Indian, Saturday, Sept. 13, at 3 p.m. The Smithsonian Latino Center presents “Encuentro de Poetas Salvadoreños: An Evening of Spoken Word & Performance” at the National Museum of the American Indian, Thursday, Oct. 2, at 6:30 p.m. This dynamic evening of spoken word and performance will bring together four Salvadorian poets from the West and East Coasts. Toddlers from 14 months to 3 years old can learn about Caribbean Taíno culture through stories, song and hands-on activities, every Wednesday through Dec. 10, at 10:15 a.m. and 11:15 a.m. at the National Museum of the American Indian in New York. Information and registration is available by calling (212) 514-3702. The National Museum of Natural History will host bilingual book readings with Susan Stockdale, author and illustrator of children’s books on nature (Saturday, Sept. 6, from 1 p.m. to 3 p.m.), and with Cecilia Velástegui, Ecuadorian author of the book Olinguito Speaks Up, about this new mammal species (Saturday, Oct. 4, from 1 p.m. to 3 p.m.). Recommended for ages 12 and younger. The Insect Zoo at the National Museum of Natural History will feature “La vida de los insectos,” Saturday, Sept. 20, from 10 a.m. to 3 p.m. The day will feature tarantula feedings, crafts and other activities in Spanish during which visitors can learn more about Latin American insects and butterflies. The National Portrait Gallery will host four portrait story days for visitors to learn more about Latino activists César Chávez (Saturday, Sept. 20, at 1 p.m., 2 p.m. and 3 p.m., and Sunday, Sept. 21, at 2 p.m., 3 p.m. and 4 p.m.), and Dolores Huerta (Saturday, Sept. 27, at 1 p.m., 2 p.m. and 3 p.m., and Sunday, Sept. 28, at 2 p.m., 3 p.m. and 4 p.m.). Youngsters and their families can drop in to listen to a story about the labor leaders and then create an artwork. Andrés Salguero uses sing-along songs and dance to teach children ages 2 to 6 new Spanish words during ¡Uno, Dos, Tres con Andrés! at the S. Dillon Ripley Center, Wednesday to Friday, Oct. 1–3, at 10:15 a.m. and 11:30 a.m. Ticket information is available by calling (202) 633-8700. During ZooFiesta at the National Zoo, visitors can learn about animals native to Latin America. Family activities include animal feedings, arts and crafts, musical entertainment, educational activities highlighting conservation research in Central and South America and authentic gourmet cuisine at a Latin American-inspired food bazaar Sunday, Sept. 21, from 11 a.m. to 4 p.m. The National Museum of the American Indian will host “KARUKINKA: Chilean Patagonia, Artists of the Land Where the Trees Talk,” Thursday to Sunday, Oct. 2–5, from 10 a.m. to 5:30 p.m. The festival will celebrate the native culture of Chile with an art market, panel discussions about roles of Native Chilean women, an exhibition of traditional arts and crafts, hands-on activities, demonstrations for kids and a sampling of Chilean cuisine. The Los Quetzales Mexican Dance Ensemble will take the stage in a swirl of colorful costumes for two special performances at the National Museum of Natural History, Wednesday, Oct. 8, at 10:15 a.m. and 11:30 a.m. Ticket information is available by calling (202) 633-8700. The Anacostia Community Museum will screen Celia the Queen, an award-winning documentary that examines the legacy of Celia Cruz (Sunday, Sept. 21; 2 p.m.) and New Muslim Cool (Sunday, Oct. 12; 2 p.m.). Hamza Pérez, the film’s main character, will participate in an audience discussion and Q&A following the screening. Information and registration is available by calling (202) 633-4844. The National Portrait Gallery presents “Portraiture Now: Staging the Self,” an exhibition of contemporary portraiture that features the work of six artists of Latino background as they explore the ways that identities are constructed and negotiated via portraiture. The exhibition is open daily from 11:30 a.m. to 7 p.m. The National Museum of the American Indian presents “Cerámica de los Ancestros: Central America’s Past Revealed,” a bilingual exhibition that illuminates Central America’s diverse and dynamic ancestral heritage with a selection of more than 160 objects. The exhibition is open daily from 10 a.m. to 5:30 p.m. Visitors can view Celia Cruz, a portrait by Robert Weingarten created as a “visual biography” of the Cuban-born singer, along with some of Cruz’s stage accessories and personal items, at the National Museum of American History, open daily from 10 a.m. to 5:30 p.m.